Romancing the Genres: Lost in Which Genre? Diana McCollum-- Life is often chaotic in our home, but when I have a few hours of uninterrupted writing time, I use it, as it is a precious commodity. A lifetime avid reader, I enjoy creating worlds where anything is possible. I can’t help but include an element of the paranormal in my stories, and always a happily-ever-after. For me there are different levels of being ‘lost in a book’. I read a lot of different genres. Straight romance, Regency’s in particular, I find highly entertaining. However, they are books I can read a chapter and put the book aside. I tend to read these types of stories in the evening, in bed. I’m “lost in the story” enough to enjoy, but not enough to keep me awake. 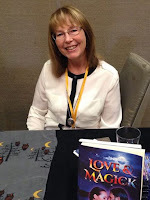 Paranormal, Romance and Suspense author Nora Roberts’ story lines are fast paced, cover tough topics and are good, because of that I do have a hard time stopping at just one chapter. If I sit with one of her books, I’ll be ‘lost in the book’ and reading for a couple of hours. Her stories come alive, and I have to find out what happens. For me most romances and some romantic suspense books are ‘slow paced’. When they are not fast paced I tend to get bored, and can easily put the book aside for a day or two. I usually read this type when I take a break from household tasks. I don’t know if it is because I’m a mature reader now, but I seem to be pickier about what I spend my time reading. Now a good thriller, like the one I’m reading right now by Harlan Coben, “Missing You”, will keep me reading straight through to the end. With three interlacing plot lines and fast pacing I’m intrigued to the very end. No reading one chapter at a time with his book! I know this probably seems strange to enjoy thrillers most of all when I write paranormal romance! Hey, each to his own choices. That’s what entertains me!! Do you read certain books during the day, night or. .? If you haven’t read my book “The Witch with the Trident Tattoo”, leave a comment and you could win a free e-book copy. I'm the opposite of you, Diana. I don't like face-paced page turners no matter what time of day I'm reading. I do like a well-crafted book that has tension and plot twists so "pacing" is important to me. Margie Lawson uses paragraphs from Harlan Coben's books in some of her classes. I found that made my ability to focus on what she was teaching more challenging for me because of the darkness, horror, thriller aspect. I will admit if that's what you want to read, he and Nora do it well! I haven't tried reading different types of books at different times of day. I think I will try this to avoid staying up too late reading. Thanks for the tip! Loved The Witch With the Trident Tattoo! Can't wait to read your next in the series! I'm a one book at a time person. One for research and one--oh, I guess right now I'm reading two for research. Other than my critique partners manuscripts and some anthology short stories, I haven't been able to read much for pleasure. When I do, I read one book to the end unless I don't like it, then I put it to the side and try another one. I have limited time to read for enjoyment and want what I'm reading to hold my attention. I haven't read a Nora Roberts in years. I have a Sue Grafton I want to read and several other mysteries on my shelf that as soon as I get this current mystery book written, I'll read one of those while I write a western romance. Great post! There are some books I can't read before I go to bed. Thrillers that are highly emotional. I haven't read Harlan Coben, though I've studied his techniques in Margie classes. I love Michael Connelly. I stopped reading Lee Child a while back. Too graphic. I need to go back to a quiet book now and actually get back to reading fiction. I've neglected it for over a month. I do have a lot of Regencies on my TBR shelves. That sounds like a good idea. Maybe in tribute to Lynn Kerstan's passing, I'll get out her cat trilogy. Sometime I intend to reread all of Jo Beverley's books. I sure do miss her. If I'm reading fiction at night, I usually stop early and write in my journal, to distract myself from what I was reading and calm down whatever emotions were triggered. Great post, Diana. Like many have commented here, I don't have much time to read for pleasure anymore. My schedule is too packed. About three times a year I just need a break from working all the time. When that happens I will take an entire day and read. Then I read a book from start to finish. Though I do write suspense sometimes, like Expendable and the books that will follow, I don't often choose to read that on my one day off. I tend to choose something that is emotional but that I always know will end with a happily ever after. I do love suspense and thrillers, if they aren't too graphic. But on my day off from working I want something more peaceful--something that won't make my brain work too hard. That's also why I haven't been going to my book group for the past six months. They are always choosing literary novels that are beautifully written but have too much thinking for my brain. I know, I'm somewhat hypocritical in this choice, as even my current romance series requires thinking about some heavy things. Fortunately, not all readers are like me. Many readers do want complex plots based in reality that are page turners. I keep telling myself that one day I'll have everything in balance so I can go back to reading other books. (big sigh) It's just not today. What a great question, what do I read and when. I read less when I'm actively working on a novel because I find voice creep can occur. Otherwise, and this is probably TMI, I have a novel in each of the two bathrooms in my house, one next to my bed and at least one in the living room. I sometimes read while I watch TV with my husband. I also used to keep a book in the car but that was when I had my son at home and was driving him around and then waiting for him. I read mostly thrillers and science fiction but for a time belonged to a book club, which taught me to broaden my selections. I read quickly so will choose and author and then tend to read everything they've done. One of my favorite authors is John Sandford. I aspire to write the way he does. Wow, everyone left such interesting answers! I tend to be like Pam and have several books going at once. And like Barb, in that I always have one non-fiction book I'm reading. Judith and Sarah thanks for stopping by. Paty, I know your research is time consuming, but I'm sure very interesting. I bet you learn a lot with those kind of books. Maggie, I hope some day you have time to sit and read and relax! I know you are one busy lady. Again, thank you for your comments!!! Great post. I will read about any genre. With that said I admit I really don't like horror -- but have read a few. I will read the first chapter of any book. If it doesn't hook me I am tempted to read no further. Sometimes I go back to it or I read the last chapter and decided if I want to know how the author got from chapter one to the end. I also will admit a read a lot. Have a great weekend. Can't wait to read your next book. Hey, Louise, from KS!!! thanks so much for stopping by. I don't read horror either. I read suspense or romance. If I'm enjoying the book, I savor it and pace myself. A really good book will have me sad at the end because it's over.